"Much of James Benning's recent work is characterized by the depiction of landscapes through the passage of time. In RR and casting a glance, produced simultaneously between 2005 and 2007, this approach is even more pointed: both films focus on landscape-altering figures. In the first instance it is the subject of trains, which trace the broad sweep of the American countryside; in the second it is Robert Smithson's famous "Earthwork", Spiral Jetty, which assumes a central role in Benning's intricate study of time. In both cases, the "protagonists" the train and the Jetty act as a kind of measuring device, laying bare not only a temporal becoming, but a myriad of historical and cultural connections as well. The abbreviation "RR" stands for "Railroad" and can be seen on signposts at railroad crossings. In Benning's case, however, "RR" signals the much larger pioneering techno logical achievement that first made urban development possible in the 19th century. Seen today as something of an anachronism, the railroad, particularly in the form of the freight train, still stands as the cornerstone of the transcontinental economic infrastructure. There is hardly a more striking example of the dichotomy between freedom and exploitation, of frontier legend and irreversible devastation. Few artifacts of the modern age reflect bothtechnology's blessing and its curse more blatantly. 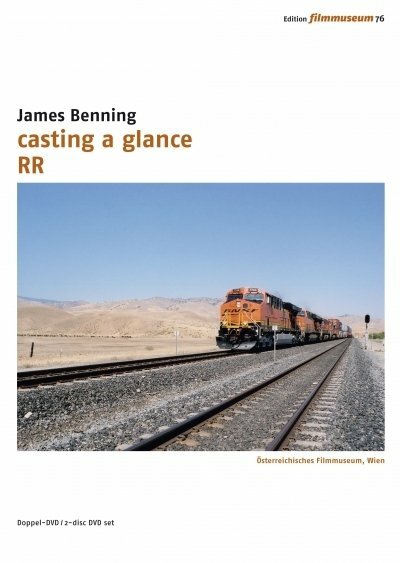 For two years, Benning assembled footage of trains throughout the U.S., depicting their movement through the frame of a static camera in a variety of surroundings. From start to finish, we see the steel monsters in their entirety, passing from idyllic and pristine landscapes to more populated and disfigured spaces, and finally through to the ends of the continent. The diversity of these locations corresponds in turn to a catalog of different forms of trains, speeds and shot lengths: ranging from very short to extremely long, the freight trains make their way by turns slowly or at great speeds, at times in the foreground orvanishing into the backdrop, through the changing scenery. Each episode brings with it an element of surprise and the unexpected: trains suddenly emerge from the vanishing point of the shot, or abruptly enter the image from the side, and each time it is the real dimension of the train that is the measure of the scene. Some shots (i.e. trains) involve only a couple of cars, while the longest train takes a good eleven minutes until it leaves the picture. Many of the shots featured in RR were recorded during the sixteen trips that Benning made to the Spiral Jetty, at the northeast of the Great Salt Lake in Utah. In April 1970, the artist Robert Smithson had created a spiral-shaped, 1500 ft. long, 15 ft. wide tongue of land, describing it as "an immobile cyclone," a "slumbering earthquake in the midst of a surging stillness." Within a few years, however, the water level rose, submerging the stone spiral. It was only 30 years later, in 2004, that the work resurfaced, and since then, depending on the snowmelt of the surrounding mountains, it appears and disappears in turns.